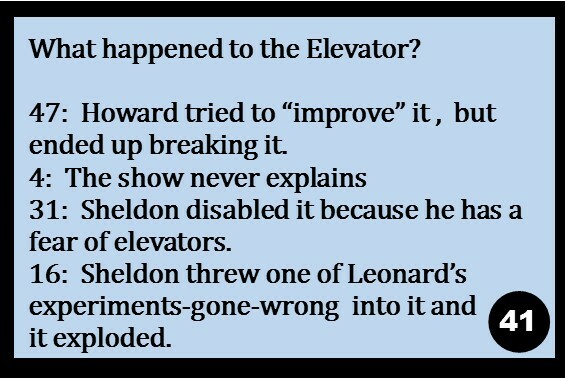 How to play the Big Bang Theory Trivia Treasure Hunt? In most treasure hunt players answer a clue and the answer leads to the next clue location. It is the same in this hunt, but one of the unique qualities of this printable treasure hunt is that you decide where the clue locations are. This hunt includes a clue locator sheet that has a list numbered 1-50. 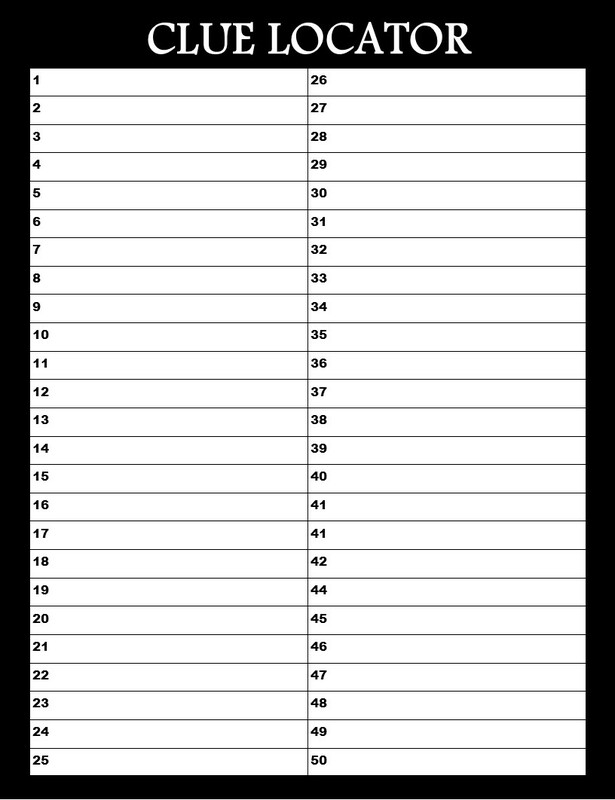 For each number on the list you write a possible location where clues may be hidden. This hunt comes with 20 clues that players must solve to find the "treasure". Twelve trivia questions, and eight visual clue puzzles. Each answer is numerical. So if players believe the answer is #13 - then they would look on their clue locator and go to the place listed as #13 to find the next clue. 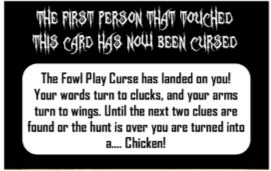 If they are right the next clue will be waiting, if they are wrong they will find a Curse card waiting that they must follow(explained below). Then they must try again at the last question until they get it right. Since there are 20 clues, we have included 30 curses to fill up the rest of the Clue Locator sheet. Below you will find examples. The clue above is an example of one of the Trivia clues. Players above would answer the clue. For this clue the answer is 16 - Sheldon threw an experiment Leonard and the other guys were working on down the elevator shaft moments before it exploded - saving everyone's life, but killing the elevator. They would then look on their clue locator and go to the place listed in spot number 16. 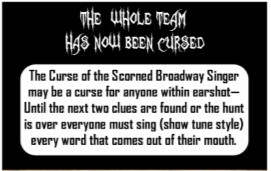 If they choose a different answer and go to one of those other spots listed they will find a "Curse" card waiting for them. Each puzzle clue is completely different type of clue from the other, and will each be solved in a different way, but the above is an example of one of our puzzle clues for this hunt (there are 8 in all). For this clue players would look at the clues and determine who did the crime. As you can see on the solved example on the right the answer is Amy and her number is 24. Players would look for their next clue in the location marked on the Clue Locator sheet as #24. As I mentioned above there are 30 curses that will be hidden in the remaining 30 spots after the 20 clues have been hidden. Each curse is different, most are for one individual player (the first player who touched the card) and some are a curse for the whole team (this game is meant to be played as a team). If a player or team is cursed they must follow the rules of the curse as listed on the card. The clues are meant to be funny, and most are going to be hilarious to watch so make sure you have your camera ready :) . 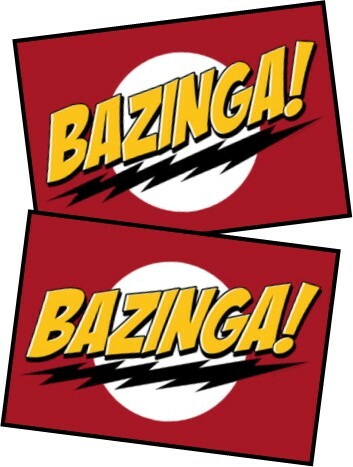 If you want an alternative to using the curse cards as a penalty for answering wrong we have also included BAZINGA cards. Bazinga cards are simply a card that reads Bazinga that players will find if they search in the wrong location. You can create your own penalty for getting a Bazinga card, if your crowd is over 21 years old you can incorporate shots as a penalty for getting a bazinga card if it's that kind of party. There are lots of ways to get creative with these. 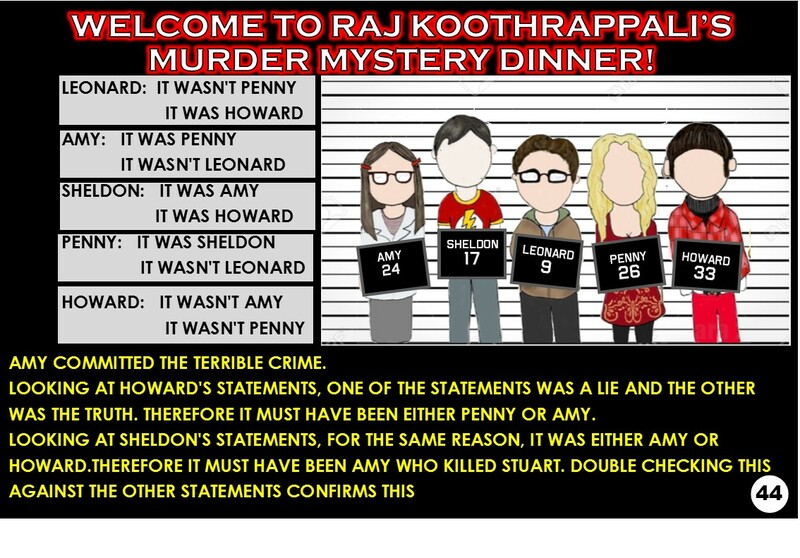 the Big Bang Theory Trivia Treasure Hunt? Each of the clues has a number in the right hand corner ( you can see this on the example clues). This tells you what place to hide the clue. If the number is 18. Then you will hide the clue in whatever hiding place you chose to write down on the Clue Locator sheet as #18. You will need to place each of your clues and curses (or bazinga cards) in a basic envelope (envelopes not included). 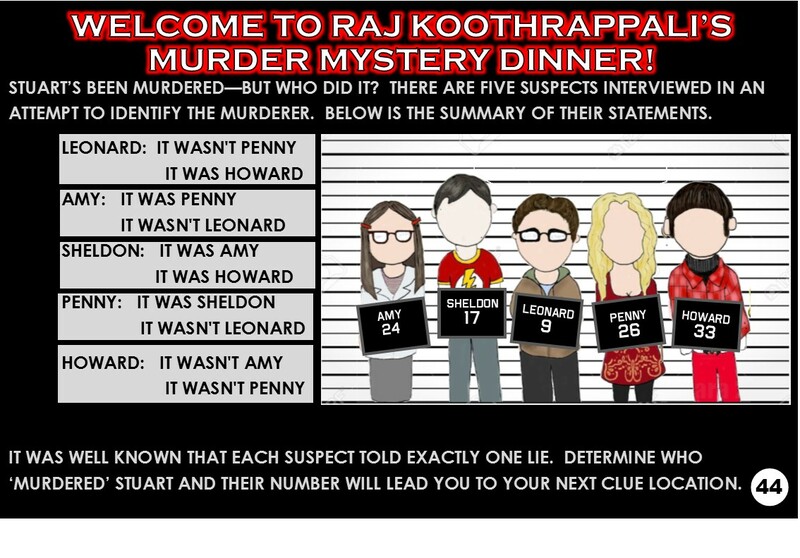 This makes it so much more fun because unless they are 100% sure of their answer, the team will not know whether they have found the next clue or a curse until they open it. This will be funny in it self once they catch on that most curses land on the first person that touches it. Again unless they are positive of their answer their will probably be some " no, YOU pick up" banter. ADDITIONAL ITEMS NEEDED TO PLAY HUNT: As I mentioned above you will need envelopes, but a few of the curses require props. The props are all simple things that you can probably find around your house. They include: toilet paper, broom, blindfold (or something that can be used as a blindfold) and a bag of random clothing (this is for a curse where they have to put it all on and wear it, so the more goofy the better). HIDING THE CLUES: Ok, so on with the instructions. You simply hide all the clues at the location number listed in the bottom right hand corner of each, and then put the curse cards in the remaining hiding places. There is one clue that doesn't have a number in the corner, but instead a star. This clue is the one that you give to teams at the start of the game to get them started. Place the curse cards in the remaining places as above. WHEN PLAYING WITH MULTIPLE TEAMS: As far as teams go, you can play in one big team or divide players into smaller teams. For each team you will want to print out a separate set of the 20 clues and a separate Clue locator sheet. The reason for this is so that teams aren't following each other to the clues and the game gets spread out. For each team you create a separate Clue Locator sheet and change the hiding places for the clues (hiding their set of clues accordingly) you can leave the decoy curses in the same spots and have teams share those because there is a much less chance of players getting the wrong answer at the same time. The first team to complete the hunt and find the 'YOU WIN' card wins! NOTE: You do not have to play with multiple teams, you can play this game with one team as a cooperative hunt. You cannot however play this game as individuals because some of the curse cards involve needing your teams help - plus it's so much more fun as a group. What age range is it for? I would say between the ages of 14 and up. And covers material from the show, so if your crowd is too young for some of the adult material on the show they will also be too young for some of the clues. Some of the curses might be a considered silly for some adults to be comfortable with (not me, I'm 34 and I love the chance to loosen up and act goofy). How long does the hunt take to play? This really depends on your group, how hard the hiding places are, and how spread out the hunt is (some people play them across the neighborhood). I would say on average an hour - but it really depends. What should I print on? You can print on regular paper, some choose to print on card stock because it creates a sturdier product. It does need to be printed in color. All pieces come in high resolution dpi. 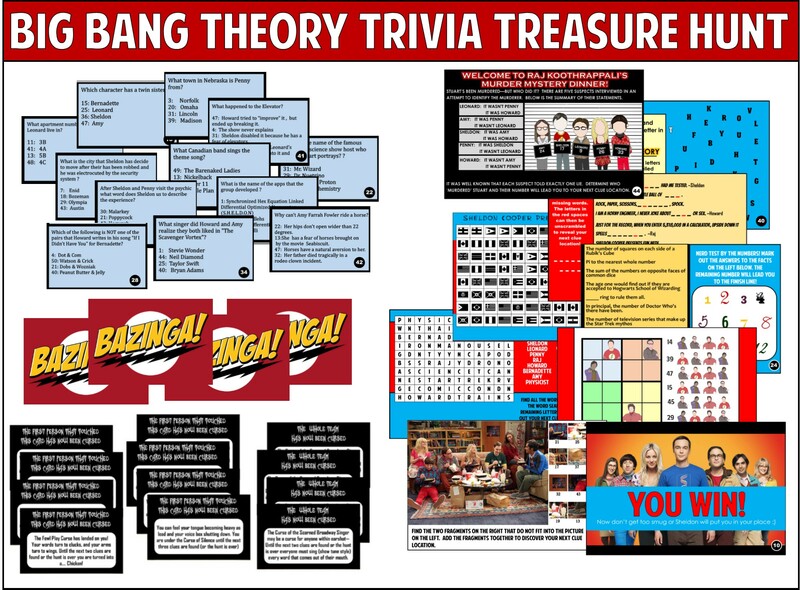 Order your Big Bang Theory Trivia Treasure Hunt Below for $13.99 - INSTANT DOWNLOAD!